Mango Milkshake, rich and creamy drink we cannot stop in a single glass.Alphonso and other juicy mangoes are perfect to prepare this milkshake recipes. Also replace sugar with honey as a healthy constraint. Let’s see how to make mango milkshake. Wash mangoes, peel off skin and cut into random cubes. 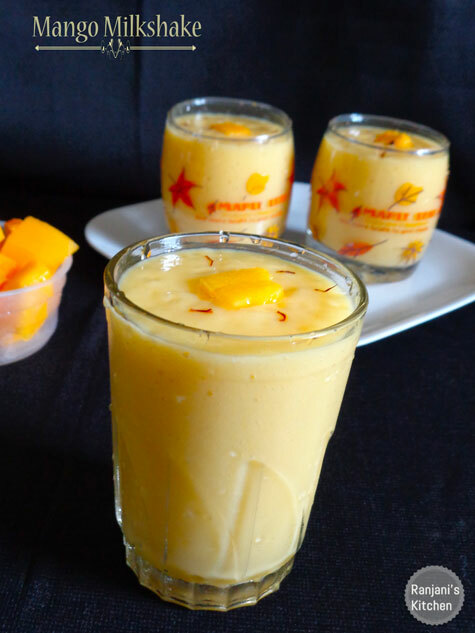 In a processor or mixer, add chopped mango pulps, chilled milk, sugar and ice cream. Transfer this chilled milkshake in glasses. Garnish with saffron strands and mango pulps. Adding ice cream is completely optional. We can add mango essence also for more flavor. Use any variety of mangoes to make the milkshake. We can top with nuts also while serving. Serve chilled. If the milk is not chill enough, you can refrigerate the milkshake for an hour before serving. Adjust the sugar level as for your taste.